The Work Sharp Combo Knife Sharpener is the most affordable model from Work Sharp. Before we get into the review, the most important feature to take note of this combo knife sharpener is the 25-degree bevel edge it delivers. The Combo Knife Sharpener is the most affordable bench-top solution for sharpening outdoor knives, pocket knives, kitchen knives, and serrations. Click on image to check the lowest price and review. If you only own Japanese style of knives or other knives grounded at 15-degree angle, you may want to consider the Ken Onion Edition, which has a variable angle adjustment. 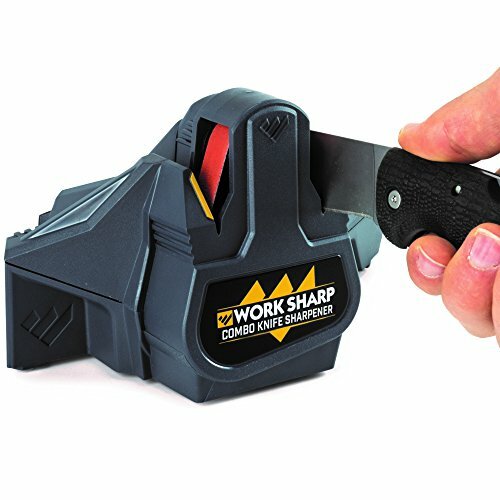 Work Sharp developed a range of electric belt knife sharpeners to suit for different purposes or uses. If you’ve to sharpen knives at 25-degree edge only, then you need this sharpener. Most importantly, it’s budget-friendly and well-built. Work Sharp WSCMB Combo Knife Sharpener allows you to keep each of your knives in top condition. Whether it’s a chef’s knife, utility knife, hunting knife, butcher’s knife, or even a tactical knife, this tool will make it as sharp as it was the day you bought it, or even sharper! If you’re already familiar with this model and want to skip this review, go ahead and check the lowest price on Amazon. Okay, let’s go through the features, pros and cons and some tips in this review. Versatility – You can use this sharpener to sharpen literally any kind of knife. Apart from those you use in your kitchen, you can use this sharpener to sharpen pocket knives, tactical knives, or any type of blade (long or short). 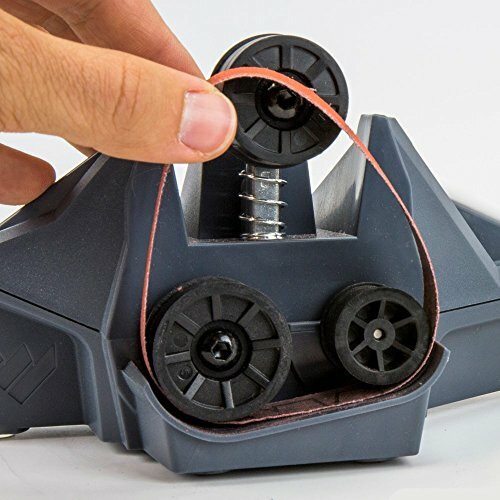 Single belt, single speed sharpening – Thanks to the fact that this sharpener spins the same wheel at the exact same speed. That means you get the same results every time. Flexible belt – Because it’s flexible, the belt creates a convex grind on the knife’s blade. In turn, this makes the edge razor-sharp. Cool sharpening – Another thing that makes Work Sharp WSCMB combo knife sharpener a really good choice is that it doesn’t create any heat along the way. At least not as intense that it would cause any damage to your knives. Precision sharpening guides – The sharpener is designed to make your work really easy, with sharpening guides that eliminate any possible guesswork. What this basically means is that you don’t have to think much about it, just place the knife in and let the sharpener do its thing. Replaceable sharpening belts – With a single push of the button, you will be able to remove the belt and replace it with a new one. But, mind you, this is something that you won’t need to do for a really long time after buying this sharpener. The 3M abrasive belt is made to last for years! However, if you’re not getting used to changing belts, read the reviews on best knife sharpener to find your perfect choice. If you’re still not convinced that buying this sharpener is the right thing to do, there’s one more thing you need to know – this sharpener is extremely easy to use. This is a tool that can turn a dull blade into a super-sharp knife in only a couple of moments. The best thing is that you can start using it right after taking it out of the box. No assembly required, simply plug the sharpener in the power outlet and turn it on. Now make a few passes on each slot with the knife along the sharpening guides. Depending on the length of the blade, it’ll require at a rate of one second per inch. While doing this, you don’t have to think too much – the tool will do all the work for you. The 25-degree precision guides (yellow guided slot) are there to ensure that you won’t have to guess the right sharpening angle. This way, you will get the same level of blade sharpness each time. Once a burr is detected, finish the job on the ceramic hone with another few passes. The ceramic rod is not one size fits all. It is tapered from thick to thin so it’s good for serrated knives as well. The Work Sharp Combo Knife Sharpener really delivered sharp blades. In fact, when done, you’ll get a knife that’s as sharp (or even sharper) than a brand-new knife! The best thing is that this sharpener is designed so that it doesn’t create too much heat. This means that you don’t have to turn it off between sharpening two knives. You can safely sharpen all of the knives you own in one go with the ½ x 10-inch premium 3M abrasive belt. And when the time comes to replacing the sharpening belt, you’ll be able to do it in less than one minute. Actually, the only thing you need to do to take out the old belt is press the belt tensioner after moving the sharpening guides to one side. What’s left is to put the new belt in, bring the guide back to its place, and voila, you’re good to go! Work Sharp developed 3 different types of portable power sharpeners. The Work Sharp Ken Onion Edition is the most powerful sharpener with adjustable angles and variable speeds. This is great for ultimate knife and tool sharpening, including major repairs. Next is the Work Sharp’s Original Knife & Tool Sharpener. This is second to the Ken Onion Edition with lesser control but still considered a versatile and powerful sharpen. The Work Sharp Combo Knife Sharpener is the simplest and cheapest model for normal knife sharpening among the 3 power sharpeners. In general, it’s good enough to sharpen a wide variety of knives for daily needs. You’ve probably already figured out by now that this sharpener has plenty of advantages. Obviously, the big one is that it’s very easy to use, and no learning curve. On top of that, this sharpener is also very quick and efficient, not to mention that it does a really good sharpening job. The flexible abrasive belts can sharpen a wide variety of knives. It develops a superior convex grind on the edge that is much durable and superior to the V-shaped edge. Of course, it’ll stay sharp longer and cuts better than flat ground bevels. It also did a good job on very long blades like machete and hatchet. It literally repairs damaged edges in a few minutes. 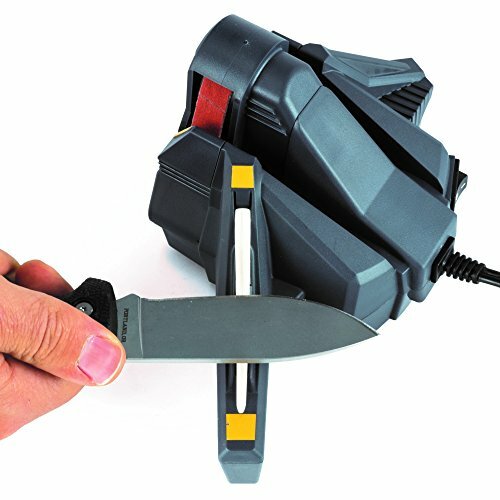 This combo knife sharpener is great in terms of quality, which isn’t a surprise considering the fact that it’s manufactured by a reputable US-based company that’s been in the business for more than four decades. So, are there any bad sides to this product? Well, some users complain that it’s actually too good at blade sharpening. It can make any knife razor-sharp, but that comes with a price – it may remove too much material off the blade. 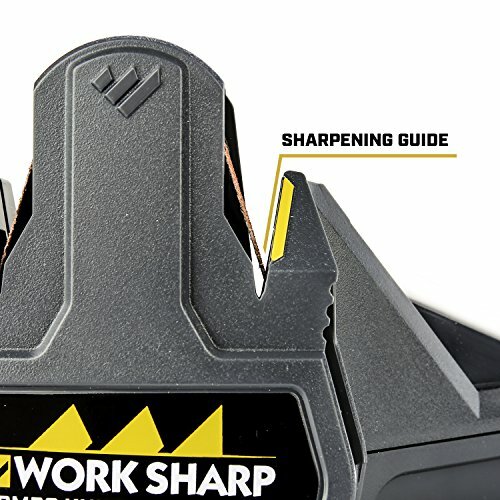 The Work Sharp Combo Knife Sharpener is designed for right-handed users. The handhold is on the left side of the unit, and this is one of the disadvantages to left-handed users. The only way is to turn the sharpener around to get the job done but the results may differ. It may take a while to perfect the edge. While this unit is small and portable which is a pro, it also affects the spot to hold the unit on the left side. Work Sharp strives to keep the footprint relatively small but the holder is also relatively thin or too small for a full grab. This sharpener is suitable for knives with wider angle edge at 25 degree, such as hunting knives, utility knives, or any blade you intend to re-profile. It’s not suitable for expensive knives since most of these knives are grounded at a steeper edge. You may only use this sharpener for the conventional American/European style of knives. Work Sharp WSCMB combo knife sharpener is superior to most of the sharpeners in its price range. Small and powerful, you need to treat it with respect. Otherwise, you will end up grinding too much material off your knives, making them thin and weak. Instead, our advice is to limit it to only a few passes along the sharpening belt per one knife. In some cases, even a single go is enough to make the blade extremely sharp. This goes especially for those knives that aren’t made of premium-grade materials or those knives with blades that are too thin. The sharpener only comes with one type of belt (220 grit), good for normal coarse sharpening. You may need additional purchase for finer sand belts (up to 5000 grit) for superfine sharpening task. This is very useful when you want to skip the coarse grinding and only need to do a quick polish of the knife before using it. Who is This Combo Knife Sharpener for? Considering the performances of this sharpener you would think that it is meant for professional use. But, when you take a look at its price tag, you realize that anyone can have a professional-grade sharpener in their home. You definitely shouldn’t miss buying such an affordable sharpener with such impressive features. With Work Sharp Combo Knife Sharpener in your home, you will be able to sharpen literally any knife you own – kitchen, pocket, hunting, tactical knives, and so on. Work Sharp Combo Knife Sharpener – you just got to love it! Other than the fixed angle at 25-degree, the thin holder and the design for left-handed users, there aren’t many disadvantages to talk about this tool. Everyone could do with such a tool in their home, so why not get one and try it out? We’d highly recommend it for simple sharpening task, especially the price of this sharpener is pretty low considering its performances!